One of the most important aspects of leadership in the body of Christ lies in the vital responsibility of team training. If a leader does not impart expectations, culture and attitude to the team he or she is leading and depending upon, it is a distinct possibility that the team will crumble at its very core. I recently trained my team of incredible, world-changing women for the upcoming year of Bible Study that touches literally hundreds of women in my region of the country. It is absolutely necessary that the 50 women in leadership be exemplary role models of the ministry I lead. I am not developing slaves, but I am developing daughters who will live richly and strongly in spite of storms, disappointments and challenges. To these women in servant-leadership, I gave a presentation on "5 Expectations of Leadership." Perhaps you would like to consider these principles for your organization or ministry as well. 1. Joy – Don't leave home without joy! Someone who is called to service in the kingdom of God should never allow the frustrations of the marketplace, marriage, parenting, finances or the election to rob them of this grand commodity known as joy. The women in my organization are the most joyful women on the face of the planet. I don't ask the women under my leadership to be someone they are not or to come in a masquerade. I simply ask them to exhibit the fruit of the Holy Spirit known and identified as "joy." I encourage them to be the women that Jesus made them to be — and He made them to be women of joy! 2. Be an Encourager – "But encourage one another day after day after day while it is still called 'Today' ... " (Heb. 3:13, NASB). Today is a good day to encourage every person you meet! It is the very reason why you are still alive! The reason that you are sucking in oxygen another day is so that you can be an encouragement to the world around you. The primary reason your heart is still beating is so you can encourage the discouraged. Encouragement can actually change the course of another person's day, week or life. 3. Faithfulness – I ask all of my servant-leaders to be faithful in their attendance and in their commitment. Come when you have a headache. You might be healed! Come when you have too much to do. You need Jesus more than anything! Come when your finances are tight and give a dollar. You might receive a breakthrough! Come when you are discouraged and depressed because joy and encouragement are found in His presence and with His people.
" ... all His work is done in faithfulness" (Ps. 33:4, NASB). As leaders, it is important to work like the Lord works and all of His work springs out of His faithful and dependable character. As believers, we love it when the Lord is faithful to His Word and to His promises. I believe that our faithful Father loves it when we, His children, are faithful to our word and to our commitments. 4. Personal Disciplines – In my quest to build women who will not wilt under criticism but will have enough strength in their personal deposit to share with others, I encourage them to stay disciplined in their personal lives. Spend time in worship every day. Be a tither and a giver. Fast a couple of times a year. The reason that I expect these personal disciplines to be a vibrant part of the lives of the women who are leaders is because I want them to live abundantly. I want them to flourish when other women wilt. 5. Positive Words – As leaders, we will be involved in all types of conversations and in many arenas of influence. Our words are perhaps the most important and visible way we lead, and as such, our words must perpetually reflect faith, encouragement and a positive outlook on life. There is no room for negativity or for unnecessary criticism in the life of a leader. 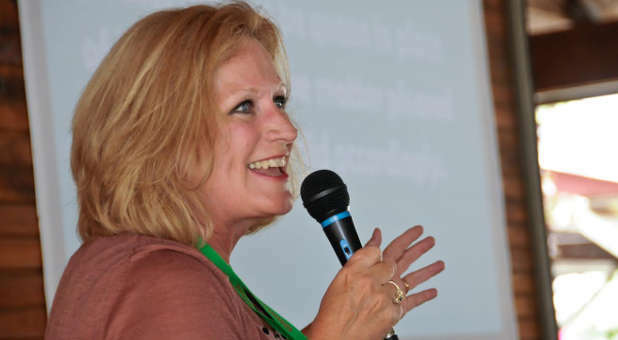 Carol McLeod is an author and popular speaker at women's conferences and retreats, where she teaches the Word of God with great joy and enthusiasm. Carol encourages and empowers women with passionate and practical biblical messages mixed with her own special brand of hope and humor. She has written five books, including No More Ordinary, Holy Estrogen!, The Rooms of a Woman's Heart and Defiant Joy! Her most recent book, Refined: Finding Joy in the Midst of the Fire, was released last August. Her teaching DVD, The Rooms of a Woman's Heart, won the Telly Award, a prestigious industry award for excellence in religious programming. You can also listen to Carol's "A Jolt of Joy" program daily on the Charisma Podcast Network. Connect with Carol or inquire about her speaking to your group at justjoyministries.com.